The Qatar National Convention Centre (QNCC) is preparing to host Qatar's largest conference to date - the United Nations' Framework Convention on Climate Change 2012 (COP18/CMP8) on 26 November to 7 December. The event is expecting an unprecedented number of delegates to Doha, representing the United Nations, its specialised agencies and related organisations, governments, non-government and inter-government agencies, civil societies and media from all over the world. The centre will be operating on a 24-hour basis as meetings are expected to run past midnight. There will also be approximately 5,000 staff on duty round-the-clock including volunteers and support staff who are currently undergoing training. All the spaces and meeting rooms in the QNCC will be utilised during this event including 40,000 square metres of indoor exhibition space and the 3,500 m² outdoor exhibition area - the equivalent to almost 10 football fields. The centre is already equipped with 52 meeting rooms, but an additional 76 meeting areas will be erected to accommodate all the delegation offices and work areas, making a total of 128 meeting spaces. There will be two halls reserved for plenary sessions for up to 2,000 delegates each, two auditoria as press conference rooms and 21 food outlets located in the Centre with a further 18 service areas around QNCC. 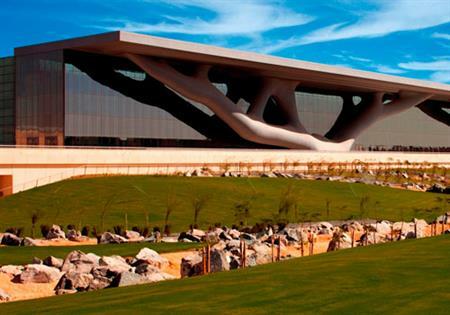 Adam Mather-Brown, General Manager of QNCC, said: "Looking closely at the logistics and floor plans, this is definitely a substantial event considering that many meetings will run simultaneously and will require a level of efficiency from our staff to ensure that tight turnarounds and event requirements are delivered. "We have been planning this event for almost one year now and we are currently setting up many of the venues to ensure that we bring the event to life on schedule." Since opening in December 2011, the QNCC has hosted 205 events, attracting more than 136,000 visitors who have generated an economic impact of more than QAR 112 million (USD30.89 mil) to Qatar’s economy. These events include large scale international conferences such as the three-week long 25th Universal Postal Congress, 20th World Petroleum Congress, World Innovation Summit for Education (WISE 2012) and three separate United Nations events as well as banquets and regional events.